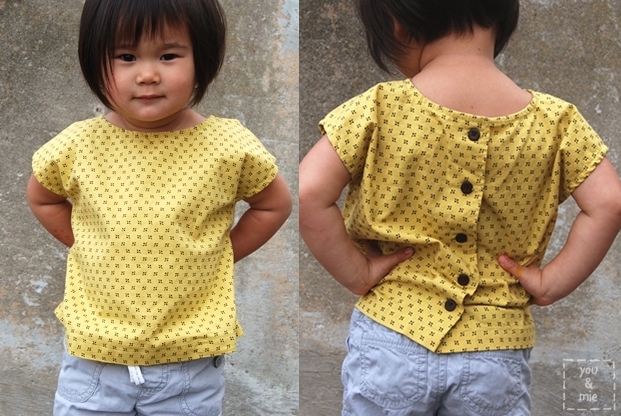 The second garment I made from a Japanese sewing book is this simple blouse from a sunny spot 女の子のまいにちの服 (Every day clothes for girls), same book I used for this top. It’s called “Simple Blouse” and it really is exactly that. I picked it, once again, because of it’s super simple construction. I was still looking for something with directions so straightforward that I could figure it out by diagram only. This top certainly fits the bill. It’s just a front and two back pieces with sleeves built in (so separate sleeves to sew in). 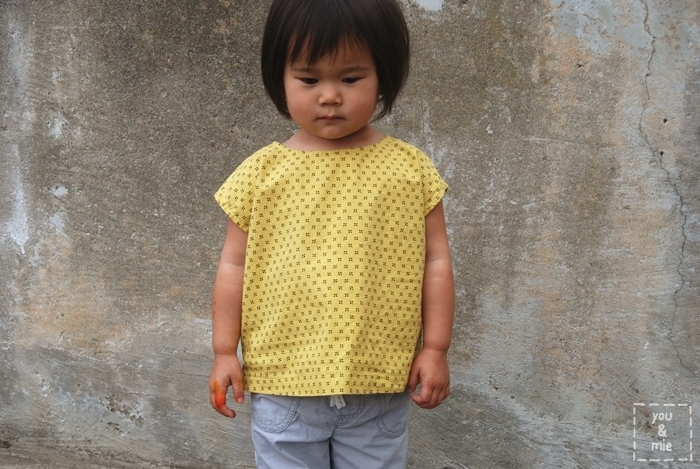 The neckline is finished with bias and there is a simple folded button placket and that’s it! I didn’t realize this earlier, but looking at these pictures, the top looks, dare I say, almost hospital gownish!? But in a cute way, right!? 😛 If you were to make this top, I might recommend a cute print, like the small floral pictured in the book, and steer clear of solids. Especially anything white or minty, to avoid the whole hospital gown thing . . . 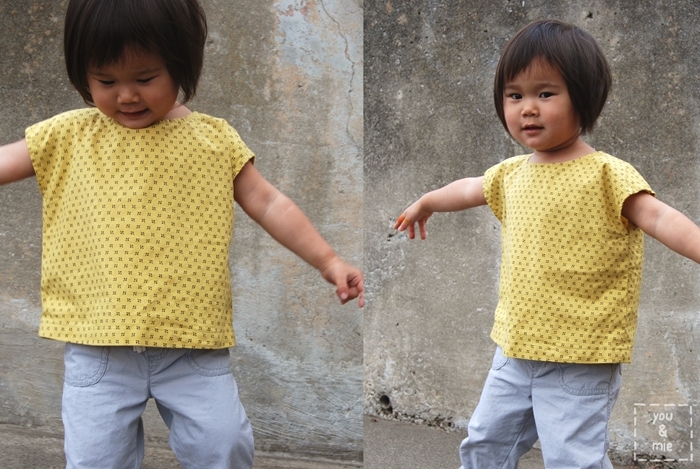 Since I made these first two tops from Japanese patterns months ago, I’ve tried a more slightly more complicated pattern (with success!) which I hope to share with you soon. 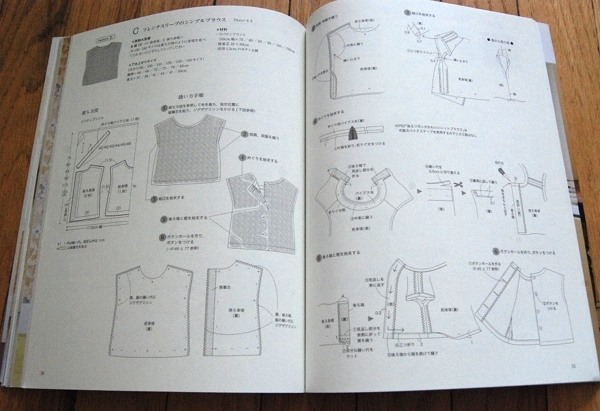 And after my wonderful guests share their knowledge with us next week during the Japanese Sewing Book Series, I know I’ll be pumping out garments from Japanese sewing books like crazy! I can’t wait! 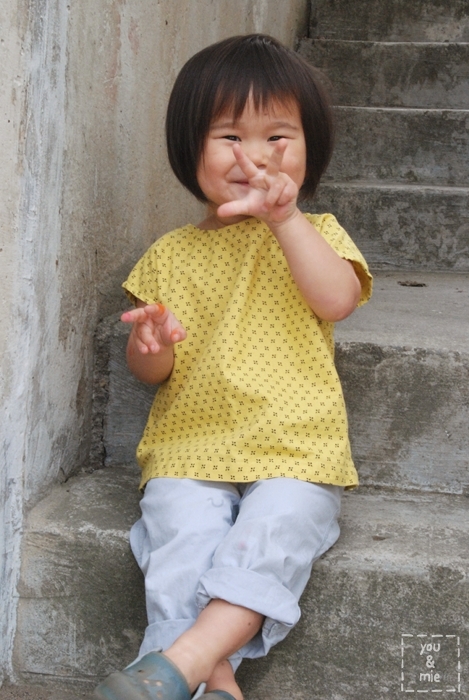 She’s starting to get a hang of this peace sign thing! 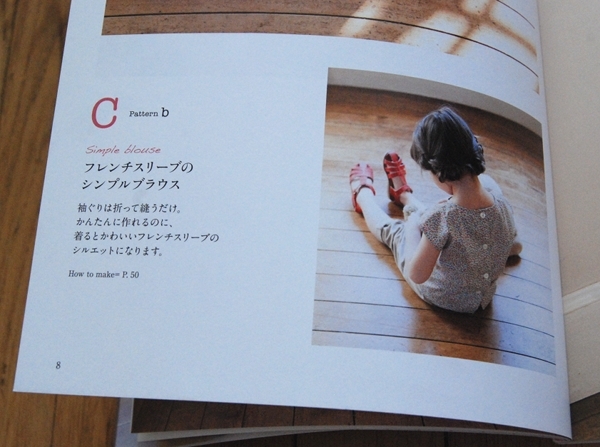 Again, if you’re interested in purchasing this book, you can find it on Amazon, Etsy, or Kinokuniya. 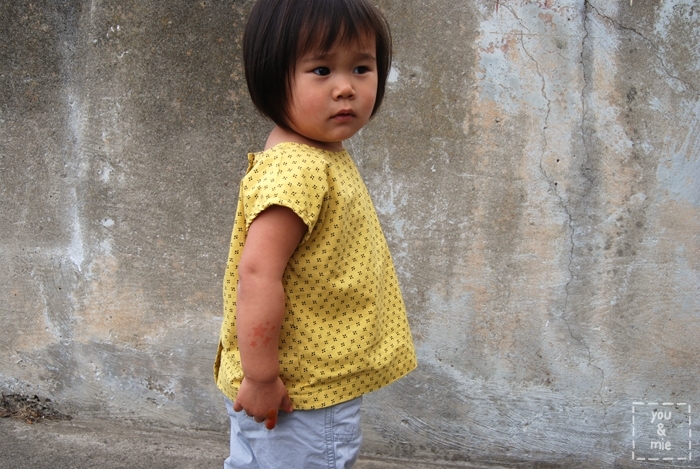 If you haven’t entered the Miss Matatabi Giveaway, make sure to do so by Sunday at noon PST! And the series starts on MONDAY! Be sure to come back each day next week for Japanese sewing book tips, translations, and inspiration from my amazing and talented guests Kristin, Sanae, Meg, Frances, and Robin. you & mie is an Amazon affiliate. I will earn a small commissions for Amazon purchases made through links provided in this post. 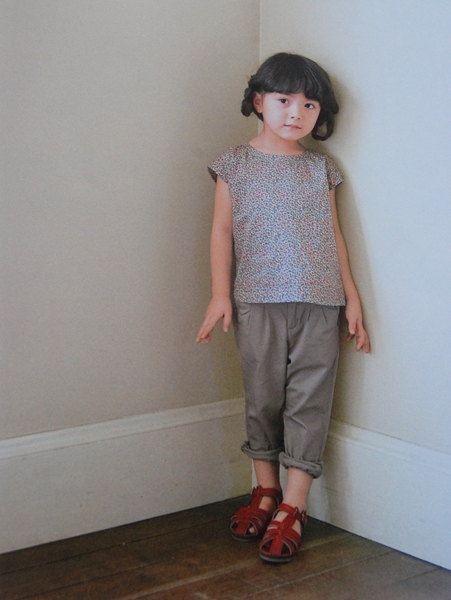 This entry was posted in sew & tell and tagged girls top, Japanese patterns, Japanese Sewing Book Series by Cherie. Bookmark the permalink. Lovely! And not at all like a hospital gown 🙂 I have the same top on my list of things to make A! I’m getting so excited for this series! BTW, I love your daughter’s sweet hair cut. I think it’s super cute! I’m looking forward to the series next week! I received a sewing machine last Christmas and so far my biggest project has been turning flair jeans into straight leg. Nothing fancy as I’m not very knowledgeable about sewing, so I’m looking forward to your posts! The top is lovely and your daughter is gorgeous! It is difficult to find these books on Amazon.co.uk, or to get them shipped from Kinokuniya or Etsy to Ireland (though I have bought from Etsy). I have used YesAsia.com very successfully, shipping is free, but the books may take a week or 2 to arrive. There are 2 ways to search – Type ‘with paper pattern’ into the search box, or click on Japanese books, then click ‘Lifestyle’ under Genres, and finally click ‘Home Arts’ to get books on sewing, knitting, crochet etc. Lovely post, your little girl looks like a delight. I can see the hospital gown-ness now that you point it out and appreciate the warning about choosing the wrong fabric and ending up with a scrub top! After much procrastinating, your series has prompted me to start a blog. Hope you don’t mind, I’m sewing along japanese-style beside you, and the other series bloggers this week. Cheers! I love that last picture. Oh Yuki. I think it turned out beautifully! Could she be any cuter??! I love it, I don’t think it’s hospital-gownish at all.